Sun shines today – the solstice has passed – for the next six months the sun’s light will dwindle for us here – though the light does not shift, only our perception of it and its visibility and the need to have faith that it is there. It seems stable for a while, and though days grow and shrink, the shift only becomes perceptible at a certain point, when we notice, closer to the equinoxes, where the half point is achieved. And this year my inner cycle has been thrown off – winter spent further south where the days and nights seem more stable and unchanging, almost equal in their duration. And i think of a conversation a week ago, with someone from the north, dark at 10pm she said – i’m not used to that right now. The clouds came back late in the day – but i know the light is there, and it shines longer now, longer than the dark – but we always have the light within. I watched the river yesterday – a different one than the Willamette that runs through town. It was the McKenzie, and i was in the forest, in the foothills of the cascades, where it is still wilder and untamed. 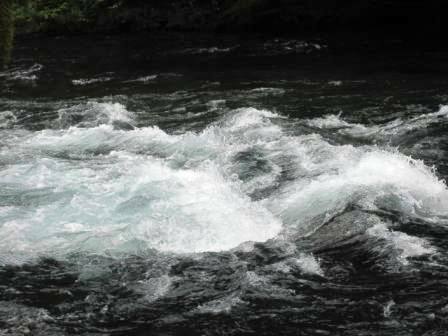 in some areas it flowed along, and in others the rapids were swift, churning the water into what appeared from the banks to be interesting shapes – forming and dissipating in a flash of the eye. And while i watched i remembered recently reading how water does not have shape, its form determined by the container – in this case the river banks and the rocks and soil beneath the surface. and with a river, how the shape is so temporary as it flows on – and unlike the ocean which i have experienced much more recently with the tides coming in and out, it visibly flows in one direction, heading out to sea. The small streams merging and joining and heading towards the largest bodies of all. And it made me think about ourselves, how much are we shaped by the containers we live in – the containers of our bodies and environments and of our minds. what is our essence – the soul inside – does it have form of its own. I saw water on the way up there in the form of light drizzle, misting in the air, and on the wet concrete and in puddles from where it recently rained. And i remembered how years before when i had been in there in the fall, snow was visible on a few of the mountain tops and how snow is just another form of what flows in the river. And so is ice and the steam that comes from my kettle in the morning. What form are we really or are we form at all? And each form of water has such a different feeling, determined in part by how it is contained. Yet it is all the same – it transforms – the frozen ice crystals, the stagnant pool, the vapour of evaporation are all its different masks. And how do you define a drop – just how do you hold water in your hands, for even as ice a solid form it begins to melt away. I watch the water and explore the world – what is and how do we define it as such. We swim in it, it is in us, and soft rafts floated down the river. How do we care for it and what does it contain – the salt of the sea, calcium or iron or the chlorine we add – or the waste and contaminants that spill into it – changing, mixing, altering is essence – or not. And like ourselves, there are so many different energies from the same body – a river – but where, and each river is different but also the same; a lake or a puddle, and ocean shore or bay- and i think of the destruction we have recently caused in the gulf as oil spews out and contaminates all. And water flows through us and in the ground below, and here where i am comes down from the sky (with all too much frequency) and shows how all is one despite the different forms, and how all may change and transform as well. 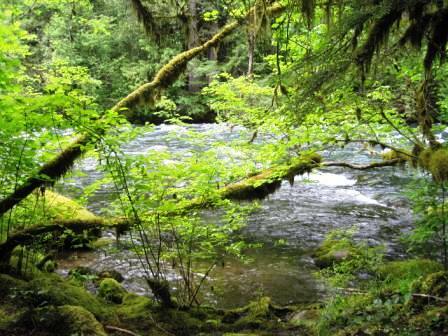 This is some of what i experienced as i stared at and listened to the river – not touching or engaging, not floating down upon it or swimming, but experiencing from the forested banks. now i sit inside and it seems so far away – as does the river that flows through town, and as i think of a title for this entry, i realize that the McKenzie of my mind is yet another river with a different energy so much further to the north, in another country, another zone, but all is connected at some of the drops that were there have probably also been here, for the rivers flow into the oceans and atmospheres that unite us all. I had planned to go up to McKenzie Bridge today – into the foothills of the cascades – to do some hiking and commune with nature, to get in tune with the spirit inside and out. Last night i looked at the weather and the little icon showed a cloud with rain and after several sunny days here i hesitated, and lost my certainty in my plans. Still i set my alarm for 6:45, and when it rang i woke up from another intense dream. And i had to get out of bed to pee. but the sky way grey, and i did not want to climb out of the zone i was in. So i lay in bed, and did not go, not really going back to sleep – the hostel was beginning to awake just past seven, with the coffee grinder, the radio with NPR and conversations just outside my door. So here i am, still in the city and realizing the pattern of not going out is what i have been doing so much of late. I will go thursday – another free day – when at the moment the weather promises sun or the lack of rain (though it still is not raining now and despite the clouds, may only be an afternoon thunderstorm). But i had looked forward to it and made plans in my mind, looking at schedules and trails on the net, and then i turned and stopped in step – or in bed as it may be. And i think of that, what has been holding me back keeping me in the zone of the known? Why do i not just step out? Or find excuses why i cannot go? I have been doing this more of late, and what is the energy that keeps my in this activity and what is the energy that the holding back creates? I will spend another day in town, get out and smile, and be in the place where i am.